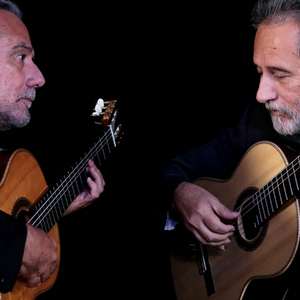 Their exceptional artistry and uncanny ensemble playing come from a family rich in Brazilian musical tradition and from their studies with the guitar/lutenist Monina Távora (1921-2011), a disciple of Andrés Segovia. In addition to setting new performance standards, the Assads have played a major role in creating and introducing new music for two guitars. Their virtuosity has inspired a wide range of composers to write for them, including Astor Piazzolla, Terryja Rileyja, Radamés Gnattali, Marlos Nobre, Nikita Koshkin, Roland Dyens, Jorge Morel, Edino Krieger and Francisco Mignone. The Assads’ repertoire includes original music composed by Sérgio Assad and his re-workings of folk and jazz music as well as Latin music of almost every style. Their standard classical repertoire includes transcriptions of the great Baroque keyboard literature of Bach, Rameau and Scarlatti and adaptations of works by such diverse figures as Gershwin, Ginastera and Debussy. Their touring programs are always a compelling blend of styles, periods and cultures. They have worked extensively with such renowned artists as Yo-Yo Ma, Nadja Salerno-Sonnenberg, Fernando Suarez Paz, Paquito D’Rivera, Gidon Kremer and Dawn Upshaw.